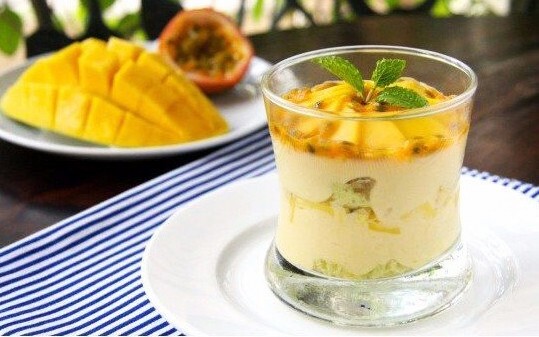 Tropical Mango Verrine is a great combination of a French dessert recipe and the fresh tropical fruits of Vietnam. It has layers of mango cream, genoise sponge soaked with mint liqueur, and topped with slices of mango and passionfruit sauce. Sweet, fruity, yet well-balanced. 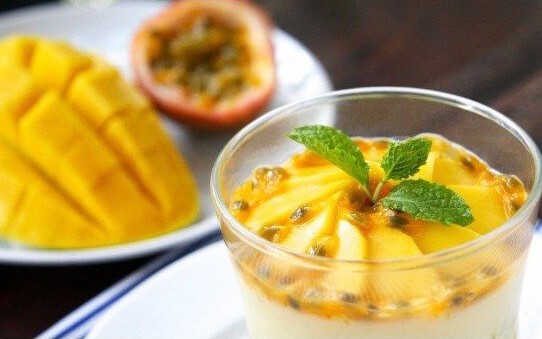 Mango Verrine is a great combination of French dessert recipe and fresh tropical fruits in Vietnam. It has layers of mango cream, mint liqueur-soaked sponge cake topped with slices of mango and passion fruit sauce. Passion fruit sauce gives it an interesting texture and serves as a great accent to this dessert. Rich yet refreshing, it's an original tropical dessert of Pizza 4P's. Perishable. Please consume it as soon as possible.